Sharon Witt has been immersed in the teen world for over two decades in her role as a secondary educator, author and presenter to adolescents and their parents around Australia. She is also the author of the bestselling Teen Talk series of books that have helped many thousands of teenagers in Australia, and beyond, to navigate their adolescent journey. 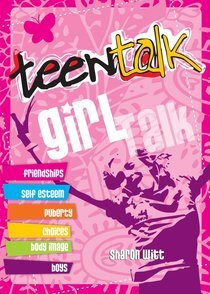 Her parenting book Teen Talk- Parent Talk, was shortlisted for the Australian Christian Publishers awards in 2012. Sharon is passionate about equipping educators and parents in understanding key issues affecting our young people, and providing practical strategies for helping them make positive choices. She lives in Melbourne, Australia with her very supportive husband Andrew and two amazing teenagers. These books offer teens bite-sized Bible-based chunks of advice on every aspect of growing up - relationships, self image, making positive choices, and goal-setting - along with a frank presentation of sexual development. Ages 10+ (parental guidance recommended).